Add a random minion to your hand. It costs (3) less. The denizens of Azeroth have no idea how much work goes into stabilizing portals. We spend like 30% of GDP on portal upkeep. I miss the days when I could play Lord Jaraxxus on turn 6. Just Summoning Portal on t4 and t5 and you're good to go pal! For 1 (or two cards including coin) you just started with 6/6. Throw in some wisps and you'll have a good time. I wish this were he actual card art for this card forever. Add a Wisp, a Target Dummy , or a Murloc Tinyfin To your hand. Woaw everyone seems to only get legendaries from this card.. Am I the only one getting Captain's Parrot? "Add a random LEGENDARY minion to your hand. It costs (3) less". 7 mana card: "put two random minions in hand, each costs 4 less"? That's not intuitive at all. The more clear text of that card should be "do nothing in late game so that you can concede next turn". The only "skill" involved in changing portal into that would be if a player is smart they stay away from that card. also 2 to 7 are not small change in number. Imagine if Fiery War Axe is 10 mana 3/10 weapon. Small change right? 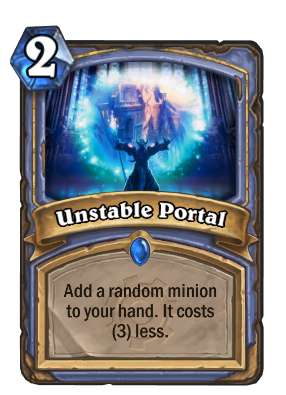 One unstable portal was in my first three cards, and the second or third card drawn was the second unstable portal. The first, played on turn 2 popped up Aviana for me and the second popped up Archmage Antonidus (which, along with most other legendaries, I don't have.) I had a Duplicate Spell sitting around and on turn 4, I used that, and then Archmage the next turn with a missile spell. He killed the Archmage giving me two. So I played Aviana by herself, and then on the next turn played two Archmages and two spells (maybe 3?.) I have an image with six firespells in my hand and two other spells for good measure, with both Archmages still up and a mirror spell of mine being triggered as my opponent tries to counter - but the image isn't loading. I like unstable portal! And two are in fact better than one. Fun fact, with the release of TGT this card allows a Turn 2 win, but it's as likely as me getting a girlfriend. Cool idea. Too bad your board will be too full of Spellslingers to fit any more long before your Mana Wyrm has 30 attack.